The second day (25 April) of the festivities and it was a bright but nippy morning. 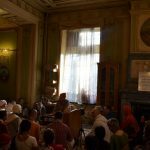 Guru Puja had just finished, the temple room was packed to overflowing and Maharaj strode in to give the morning class from the 7th Canto. It was all about the mentality of Hiranyakashipu. Quite a macabre subject but Maharaj has an uncanny ability of making such topics shockingly pertinent for devotees. Initially he spoke from the demonic viewpoint – how Hiranyakashipu was not able to fully appreciate the Supreme Personality of Godhead. He was such a powerful individual; yet so intimidating and nasty. At that point Maharaj made it relevant by bringing Hiranyakashipu’s traits onto us. The demonic qualities are not something far removed but are actually within us. Hiranyakashipu may be the prototype but there is also the inner Hiranyakashipu. 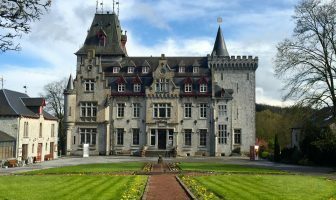 The Rg Veda may say, “Let us look upon all with loving eyes.” But we look upon others with pride thinking, “Who does he think he is?” Maharaj put forward that we often think that lust our greatest main battle but actually it is envy which brings us down; all the way down to the animalistic platform. Always ready to fight! Envy can also be indirect like Maharaj’s famous story of the wolf verbally harassing the lamb just because the lamb was drinking water from the same river! There was nothing the lamb had which the wolf wanted but just his existence was enough to aggravate the wolf – envy on a deep, deep existential level. Maharaj then did a rib tickling impression of the wolf chastising the lamb. It was brilliant; the attitude, the deep voice, the ‘British villain’ accent. Even Maharaj’s natural aquiline features went perfectly with the impression. Further elaboration on envy was to come. Envy is like who are you?! (In a challenging tone). Who are you to step into my house! Over my fence! And so on. 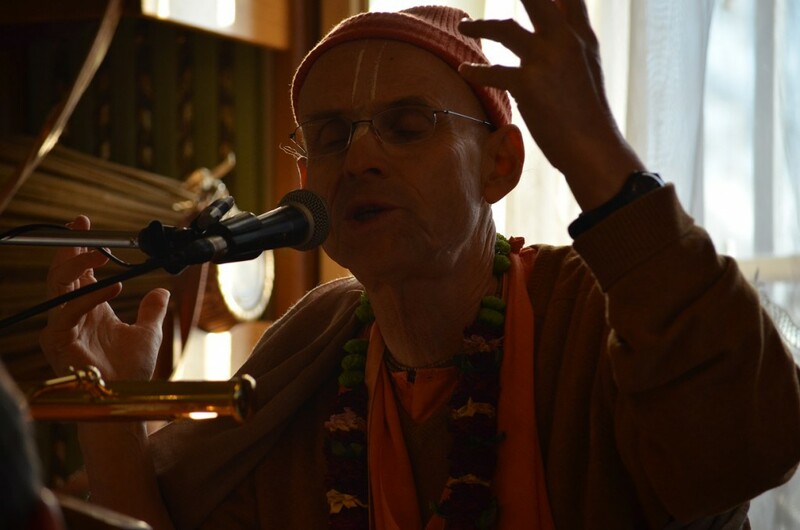 Maharaj recalled how on sankirtan he approached someone who retorted, “Who are you! Who are you to even talk to me! I DON’T EVEN KNOW YOU! !” Maharaj quipped that the guy didn’t just have a fence around his house; he had a fence around his head!! It is interesting that Maharaj gave the example of hostile people cooped up in their closed homes surrounded by unwelcome fences. It seemed like a very Western European scenario. Being from Britain, I can identify with this mentality. And since Maharaj hails from the Netherlands, one gets the feeling that growing up there, he must have encountered a lot of this mentality – the mercenary culture of self-interest, being isolated from each other and hiding behind one’s physical and psychological fences. 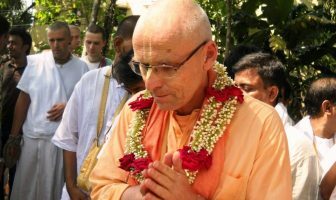 But vaisnavas are different, a vaisnava has generosity; like Srila Prabhupada dealing with all those hippies, tolerantly, patiently and lovingly. At this point Maharaj recalled his famous ‘chapatti story’ from his days as the manager of the Vrindavan restaurant. He was literally shoved into being the new manager. To spice things up, a bunch of rough, rugged and very hungry Vrajabasi villagers came bowling in, demanding a hundred or so chapattis – no airs, graces, politeness or patience. Just bring those chapattis!! Needless to say, the kitchen was like a pressure cooker. Maharaj admitted he got really pushed around by those villagers and inevitably he was passing that stress and aggro onto the kitchen staff. As if things couldn’t get any worse, the head chef finally delivered the coup de grace. Just when Maharaj was at breaking point, screaming out for the chapattis; the cook burst out of one of the kitchen cupboards and squared up to Maharaj with a big, fat grin. At the end of his thumb was a piece of moulded dough in the shape of a joker. He wiggled it at Maharaja, shaking his head and well… you know the rest!! No chapattis, no cook and some very hungry, rustic villagers. Haribol!! The devotees were in raptures from Maharaj’s narration. He has mentioned the incident so many times, but it never stops being hilarious even though it must have been nightmarish at the time. Of course, that was many years ago and Maharaj reflected that whilst it was hard for him, he also did not behave like a human being in that situation. He was really pushing his staff and was so rigid and strict. One can’t be so rigid; one has to also be soft like chapatti dough, malleable in the hands of the vaisnavas, Maharaj recommended. 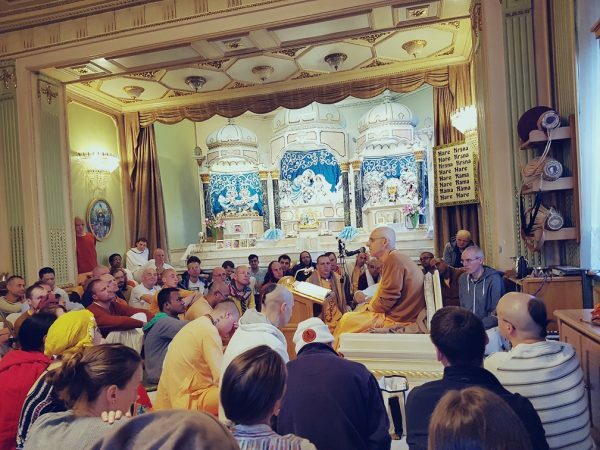 This is another theme seen in Maharaj’s lectures and conversations over the last couple of years – this sense of reflection over one’s dealings, the need to be loving towards each other, appreciating the devotees and not blowing them out. 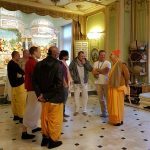 Maharaj often brings up his own dealings from the past as a way for us to learn from, so history does not repeat itself. No doubt, Maharaj was a ‘full on’ character back in the day. 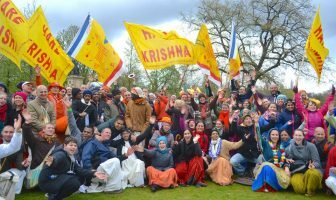 But we also should consider the social environment of the time, the pressure those devotees were under as well as the personal purification they were all going through. After so many years, it is wonderful Maharaj can subject himself to such self-examination and then reveal it for future generations to scrutinise! The class continued with deep points made on various issues. As always there was pin drop silence. I’ve always loved Maharaj’s classes. That is what initially attracted me to Maharaj. But for some reason, the classes Maharaj has been giving this year seem to be on a whole new level. One can meditate on what Maharaj has said in this year’s classes endlessly. Although Maharaj prefers talking about the beautiful, sublime aspects of Krsna consciousness; even those classes where Maharaj has spoken about the unsavoury aspects of life such as our demonic consciousness have been terrific. This class was no different. The level of insight and profoundness Maharaj has on the human psyche is staggering. 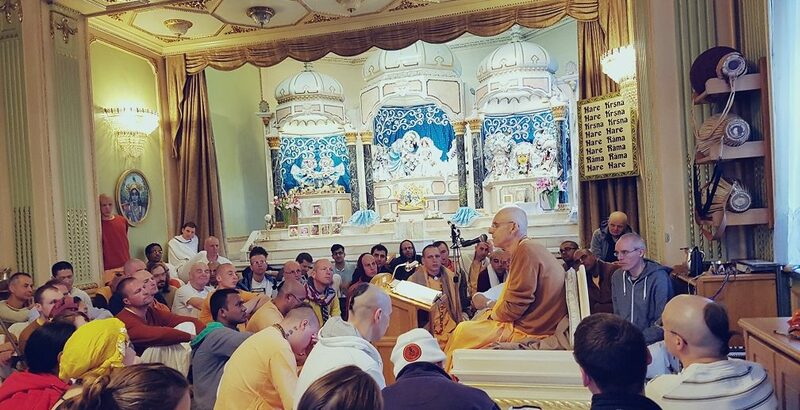 Maharaj finished of the class saying that he had a late morning due to the previous night’s kirtans, so he needed some ‘me time’ to chant rounds for the initiations ceremony which took place later that day.